S M Ong: 'Insensitive and bigoted' about Chinese New Year? Wow. I just received a long e-mail condemning my last column about why I like Christmas better than Chinese New Year. Did I really go too far this time? I refer to the subject article written by you and published on the 1st of January 2012 in The New Paper on Sunday under the 'Humour' section. I was actually expecting a light-hearted article to bring me into 2012 but unfortunately, I finished the article with aghast at how insensitive and bigoted you are writing this article. Instead of an article singing the praise of the Christmas spirit to bring insight into why you love Christmas so much, it reads more like an article 'Why I hate Chinese New Year'. Even if you do hate it, which I assume you do based on the choice of words you use, it does not give you a fraction of any rights to belittle a day celebrated by billions around the world. I believe many will feel the same if I said the same as what you did for other festivals such as Hari Raya or Deepavali for that matter. I am sure that we all have our own preferred festivals in our modern cosmopolitan society but that does not give anyone of us any right to belittle the ones that we may not prefer, especially in a national newspaper that has a considerable following here. I do not know what may have traumatised you to detest Chinese New Year so much but you definitely do not have to bring this into a public newspaper. 1) I believe that for those who truly celebrate Christmas, they do visit friends and relatives as well. A lot of expats I know personally take this chance to fly home to be with close ones during this period of Christmas celebrations. Locally, families and closed ones do visit another for turkey and Christmas goodies as well. Lousy reason you have there. 2) The colours of CNY may not be your kind of colours but this to me is the colour of the Chinese New Year which I happily celebrate every year. It brings the whole feel of CNY around the country and it is very rude and insensitive of you to describe it as tasteless, garish. 3) My dad prefers the dong dong chiang over the silent night that you probably prefer. But I don't hear my dad whining to the whole world about his preference because he respects the festivities of others as well. 4) God of Fortune creepy? Dear Mr. Ong, may I remind you that we had some uproar over here with insensitivities over religious issues and here you go stirring again. Without going into religious issues, this God of Fortune over here that we are talking about gives as much hope to everyone over the whole world who celebrates CNY as your lovely chubby Santa Claus. Till the day you are able to offer half as much hope to my little boy at home, I would think that you should perhaps offer more respect, sensitiviy and perhaps a bit of sensibility given the structure of our multicultural society , than to use the 'creepy' to describe this deity worshipped by billions. 5) Bak Kwa more expensive during CNY? Isn't this the commercial world works now? Have you tried campaigning for cheaper roses during Valentine's day? I have also never seen turkeys flying off the shelves other than during Xmas, and my, they ain't that cheap either considering no one even have them on their dinner table other than the turkey hams. 6) Great for you that you manage to find better discounts during Xmas but I don't think that should be something will come out from someone who's supposed to be intellectual to be published in a national newspaper? 7) Shopping for Xmas presents is definitely fun but it doesn't have to make shopping for the new clothes and shoes any less fun or at least enjoyable. In any case, I do know of a number of people who finds Xmas shopping a chore as they are just obliged to do it because of some parties that they feel obligated to attend to. Which is something like your point 1. 8) Have you ever been toasted good health and good wealth during Xmas or New Year? I am not the greatest bilinguist around but I would think that they mean the same with shen ti jian kang & gong xi fa cai. May all your wishes come true = xin siang shi cheng? No? 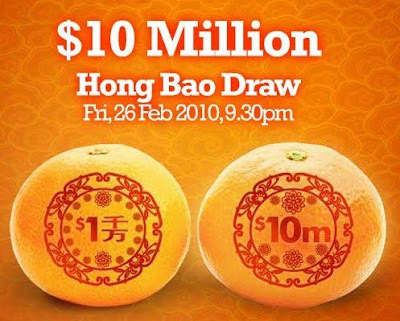 It's not Chinese New Year's fault that Singapore Pools should decide to hold the annual 10 million draw during CNY and not during Xmas. While we are all welcoming the arrival of the Spring Festival, aka Chinese New Year, I sincerely hope that you will help to promote this festive period for us Chinese. You may prefer the Xmas for reasons of your own but I hope that you realise that CNY does bring a lot of joy to others as well who celebrates it. The folks who await this festive season once a year, just like how you may anticipate Xmas, do not deserve to have someone degrade, humiliate and insult their share of festive joys. 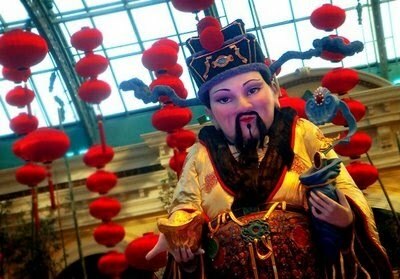 The creepy God of Fortune, 'Garish' definitely sound like choices of words used for the purpose.